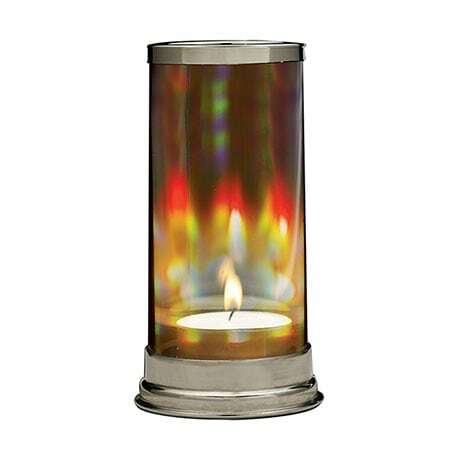 Hand-blown crystal candleholder turns candlelight and sunlight into light shows and rainbows. Hand-blown crystal column. Silver-tone metal base and rim. Holographic film inside the crystal separates light into all the colors of the spectrum. Patented design by inventor James Foley. 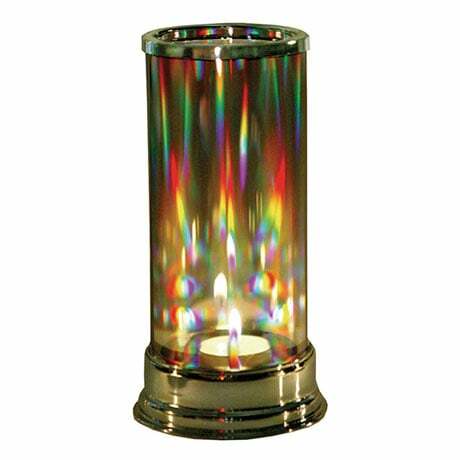 Turns candlelight into flickering, dancing 3-D rainbows. In sunlight, the crystal column becomes a prism. Dazzling and romantic. 3 1/2" diameter, 7" high. Two pieces: column and base. Uses a tea light candle (not included). Some call it the "Love Light" because it's so romantic. The patented design works magic with any kind of light. During the day, in direct sunlight, it's a tall crystal prism, catching the light and breaking it down into vivid colors. But at night is when it really shines. A simple tea light is all you need to create a color-filled, 3-D holographic light show. A single flickering flame becomes a dozen dancing, shifting rainbows.Soothing, mesmerizing, constantly changing, this unique patented hurricane is perfect outdoors on a deck, indoors as a centerpiece for your table, or anywhere you want to set a romantic mood. If one is dazzling, two or more are spectacular. Planning a wedding? Picture these at the head table or on the guest tables. Need a gift? Everyone loves this hurricane. It's irresistible.